Who doesn’t love cupcakes? I know I do. Cupcakes are a favorite for the kids and I in this house and we love to bake them as much as possible. I decided that I needed to make some stuffed cupcakes with caramel icing. They were a HIT! So yummy. I couldn’t get over how well they turned out and how easy they were to make! The cake is so fluffy and airy and beautiful and it pairs very well with the caramel as well! Together, the cupcakes and icing create a flavor explosion that can not be beat! Let’s just say after I made these, I had some people knocking on my door to try them, and once they had, they came back to see if i made more soon after. I started to feel like a cupcake factory, which is fine by me as I love to bake, so heck, I will bake some more! What surprised me was, Husband, who isn’t really much of a cake lover even gobbled these up and asked when I would be making more! Seriously, delicious! 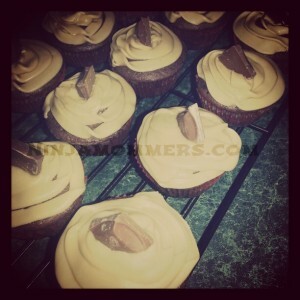 The good thing about these cupcakes, is that they are generally easy to make but they taste like you baked all day! I really couldn’t get over how wonderful the icing was either. 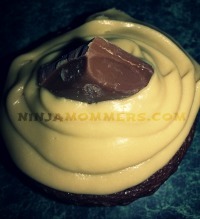 If you are a fan of caramel, then you will love the icing! I am going to make an apple bundt cake one day and use the icing while it is still warm as a drizzle over top. The possibilities are endless with this icing! So, let’s get baking! I hope you enjoy them. Come back and let me know what variations of ingredients you used and what you used to stuff these cupcakes with! A wonderful melt in your mouth chocolate cupcake, stuffed with your favorite caramel chocolate and topped with a creamy caramel icing. Preheat Oven to 350 Degrees. Place cupcake liners in tin. Stir first 4 listed ingredients together in a mixing bowl and set aside. Place the chocolate pieces in a large mixing bowl. Slowly add the boiling water. Let sit for 3 mins. Using a whisk, whisk the water and chocolate mixture until it reaches a smooth consistency. Add the butter and the eggs, vanilla and sour cream and whisk until well combined and smooth. Gradually add the sugar mixture, making sure to whisk until smooth. Fill cupcake liners 1/2 full with batter, Add Chocolate bar piece, cover with rest of the batter until batter is equally distributed among the liners. Bake for 15-20 Mins or until center feels firm. Add brown sugar, butter, milk and salt to a medium sized pot, bring to a boil. Stir frequently. Reduce heat and boil for 2 1/2 mins. Stir often. Remove mixture from heat and place in refrigerator, allowing the mixture to cool completely. Once Cooled Stir in icing sugar and vanilla and beat on low speed until mixture thickens enough to spread on cupcakes. Ice cupcakes and garnish with piece of chocolate. This was a really great, moist cake recipe combined with a fantastic icing and stuffed with your favorite chocolate. I chose a chocolate bar that has some caramel inside it because it pairs well with the caramel icing. Can you imagine paired with apple cake? delicious! Mmm, Apple Cake with Caramel Icing Drizzle, Could use the caramel icing while it’s still warm instead of cooling it and use it to drizzle over an apple bundt cake…. Hmmmm… Thanks for the Idea! These will be an awesome after diet “reward!” Thanks for the Pin! Oh my gosh – these look delicious! Now I want a cupcake for breakfast. There’s no better combo than chocolate and caramel. I would love to if I could figure out how to keep them tasty and send them! Yay to being pregnant! I remember the cravings… I didn’t crave anything too specific, or weird, but I ALWAYS wanted to eat. They were super! I Love chocolate too!